Jackie Lefko grew up in Brooklyn, NY. She was the middle child of 5 offspring to her parents. She spent a lot of time with her grandmother including attending church. Jackie really did not experience anything out of the ordinary during her childhood. As she got older she enjoyed singing and people around her noticed that she possessed the skills to be a talented singer. With dedication and hard work Jackie Lefko became the singer we love to listen in Second life. Jackie has been very busy performing in Second life but was kind enough to spare some time with me to sit down and chat about her life in Second Life and also an in-depth look into her real life which she makes no secret about. As we sat down with a cup of coffee I could tell this was going to be a fascinating chat. Tea: Can you please tell our readers a bit about yourself? Jackie: Well I am a native New Yorker, I started singing at a young age in a church in Brooklyn and enjoyed singing Jazz and Blues so became a Jazz and Blues singer. My RL experience includes sharing the stage with Concord Records Jazz recording artist Karrin Allyson in Chicago and performing in various unique venues throughout the United States and on the African continent. 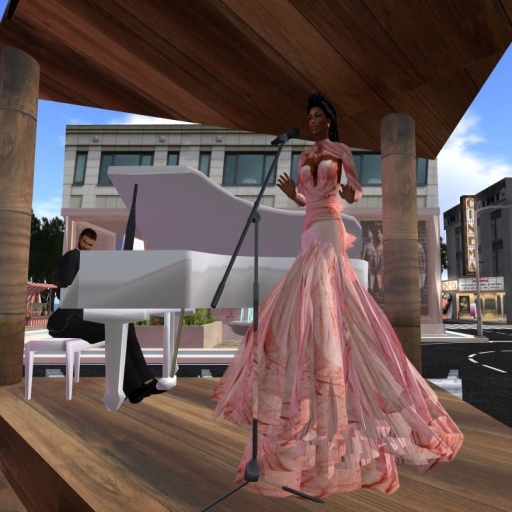 However I wanted to perform in Second life also so decided to bring my sultry vocals to Second Life also… smile. Tea: What or who inspired you to become a singer? Jackie: Music was always been an important part of my family life so it is not surprising that I started playing the piano at the age of 4. There are many family pictures with myself and sister sitting at the first piano that was purchased by my grandmother and delivered to my family’s small apartment in Brooklyn when I was about 10 years old and this is most likely the foundations of my interest in music which opened my eyes to the sound and love of music. Tea: What genre of music do you sing? Jackie: My primary genre has mostly been Jazz because I just loves Jazz. I only added blues when performing at a club and a patron requested that I learn a blues song. I now finds myself performing some contemporary songs giving them a Jazz and Blues feel. I am secretly in love in Soft Rock. So, expect to hear a very eclectic set when you attend any of my shows. Tea: How long have you been performing in Second Life or even Real Life? Tea Couturier: How important is it for artists such as yourself to find good venues to perform? Jackie: Performing at good venues allows you to expand your reach within SL and have your voice heard by people who ordinary would never have been able to connect with you in RL. It brings new RL fans in a unique way. Tea: Does having loyal supporting fans help in sl? Jackie: Having loyal fans is crucial. I know the names of my loyal fans. I see them at most of my gigs, they have joined my group and they even request me for their private parties. Tea: Do your fans help keep the love of performing in sl strong for you? Jackie: It is not different than having a favorite artists in RL, except in SL, you can actually have a personal friendship with that person. My loyal fans have become my SL friends. Tea: What do you like to do when you are not performing? Jackie: When I am not performing in SL, I am hosting other artists at my Speakeasy. I like to go to other clubs and hear some of my favorite artists sing and preferably with someone to dance with. Tea: If there could be one singer you would like to duet with who would that be and why? Jackie: I have performed a duet with Bono Foroux, a guitarist from Amsterdam. It was a great show and we have one planned for July 25th at my Harlem Speakeasy. As far as any singer I would do a duet with, I am open for suggestions. I know some fabulous male singers in SL but my first choice would probably be Maxx Sabertooth because he mentored me when I was getting set up as a SL singer and I absolutely love his voice. Tea: What is in store for Jackie this 2013? Jackie: 2013 is a foundation year for Jackie Lefko, the singer. With the help of my manager, Stacy Mosely, I strive to sing at new venues, expand my fan base and just continue to work on my craft to become the best singer I can be.